Tuesday was a 12 hour travel day from Wilson, NC to Leesburg, FL to drop off mom with her sister for the rest of the winter. We got going at 8 AM and morning travel was great. I think this was the first time I didn't stop to see Pedro at South of the Boarder for even a bathroom break. I snapped this lousy picture driving by. The weather changed when we stopped outside of Beaufort, SC for lunch. The cold front had caught up with us. The clouds and wind rolled in. The wind was gusty making my little high-profile vehicle more tedious to drive having to keep a tight grip on the steering wheel for much of the rest if the trip. As we entered FL there was some heavy showers through Jacksinville that luckily didn't cause any accidents. In fact we only saw one accident and that was in NC where a tractor trailer drove off the road on the northbound side and road the center guardrail for at least 500 ft crushing it, coming to stop on the northbound side. There is no straight way to get to Leesburg from I95 so from Jacksonville we went I10 to US301 to I75 to Florida's Turnpike. This isn't a bad way but there are many towns where the speeds are reduced. I didn't see any sign that the Florida's Turnpike was a toll road but I soon learned that I was on one of Florida's poorly planned toll roads. Those that have driven in Florida know of the system they use. I come to the exit and they want $1.25 in quarters only. These are unstaffed tolls. So now I am riffling through my pockets for quarters. I find 5 and I'm good to go. NO. I put the coins in and the toll is not happy. I am looking around and there is no notice on the machine. I just have a red light. Finally I see on the front passenger side of the car a post with "you paid $.75. There is no one to argue with so I riffle my pockets again for two more quarters and put them in and finally get the green light. It took 2 minutes and the whole time no one ever came behind me. I guess they know to avoid the toll. My aunt told me there are envelopes to take and mail in your toll. There were no words to this effect on the machine but there were envelopes. I don't know how you track your money to that toll. She also said that if you don't pay they will send me a bill. A bill that goes home would not be paid for about 4 months if it waited for me. I guess in the meantime if a FL police stopped me I would have an unpaid bill. This is not a cost issue but one of process that is flawed. I will be looking for a Sunpass at CVS or Public stores to eliminate the FL aggravation since I will be traveling through the state for over a week. FL gets a poor on customer service for their Sunpass system. We arrived at 8PM. For the night I plugged into my aunt's and although cold for them since the front came through it is mild from where I came. Boo! 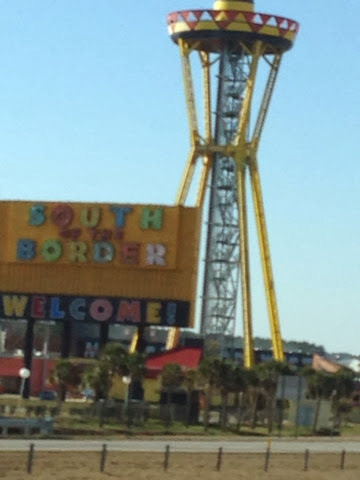 You always stop at South of the Border. The place is legendary! So sorry you missed out. Where to next?